One year ago today, I began this missive; this series I have called 'letters to the world'. Little did I know how many people would eventually respond to my scribbles. Little did I know how much enjoyment I would get from writing and from reading your responses, since your comments are often the best things about a post. It is good to see how a thoughtful comment can help us to see a situation in a new way, can help to resolve a problem, can help us to laugh and see the similarities within a diverse group of people scattered all over the world. I have told you before how much I enjoy this process; how much laughter, joy and empathy you evoke each day, how much I have come to care for and about some of you - though I have not laid eyes on you and perhaps never will (though I would surely count that as a blessing). You are some of the funniest, most empathetic, helpful, smart and sometimes awe-inspiring people around. The pleasure I gain each day from your insightful writing, your photos, your pets and your children is manifold and I hope it never stops. Each of you brings something different to blogdom, but as I read over time, it is possible to see how much we are all alike and that can only be a good thing. I sometimes get the feeling (however naive it may be) that if everyone read our writings, there might eventually be less conflict in the world. Of course, being multi-lingual would help.....LOL. We would learn to respect our differences while realizing how very similar we are. We all want the same things in the end, don't we? Peace, someone to love, children to share our lives, minds and hearts with, the closeness of family and friends, an occupation that brings us pride and fulfillment as well as our livelihood. I am immensely happy that I discovered blogs. Here's hoping that you feel the same way and that you will continue to share your hopes, dreams, talents and yes, even your frustrations. Educate me! Amuse me! Allow me to commiserate! I will try to do the same for you. What have you learned from and what do you enjoy most from your blogging experiences? Woo-hoo! I'm first! Happy anniversary!! Hi from Michele's! Oh what do i love from this blogging thing? What have I gained? Both questions can be answered the same way: A neighborhood, bigger than I ever expected filled with wonderful, interesting people. We don't all agree on politics, but most things we do agree on. Like it's a small world and we all could use a hug! Hi Judy...I am amazed how often I am the first one to comment on your posts...It's funny, too and I like it! CONGRATULATIONS, MY DEAR JUDY! What a wonderful milestone...Good For You! I have not been blogging that long, but I am amazed at this whole phenomenom...And thrilled to have met so very many interesting wonderful funny inspiring and touchingly dear people! And I feel like even the short time I've been doing this I hsave made some lovely sweet friends and I'm deeply grateful for that...I too feel like the community of people that 'The Michele Connection' attracts is sooooo very very nice...almost all the people I visit on a regular basis, with a few exceptions I met at Michele's...a true gift that 'keeps giving', as they say...I could say a lot more but this kind of is a BIG Nutshell...! I am here from Michele and saw you after I commented so I came back so yoiu would not be skipped! Here's to another GREAT year of Blogging Judy, and many many more after that, too! I have learned that diversity is not just a word, but a way of living; that maintaining a blog and actively supporting others in this endeavor is an ideal manner to learn from the diverse experiences of others. It has helped me to grow as a person and a writer. What have I learned? That I'm totally not alone. That many folks experience some of the same things that I do every single day. What do I enjoy most? Sharing my stores; the good, the bad and the annoying. And the many regular visitors to my little home...including you! Here via Michele today! It is great meeting virtual friends this way. Happy Anniversary! I am so glad to have 'met' you and I look forward to your posts daily. Here's to many future years...your blog is a wonderful place to visit each week, each day....several times a day! Happy blogging anniversary! I have been blogging for little over 3 months now. It isn't very long, but I wonder what I did without blogging before. Can't imagine a day without at least thinking about posting! Blogs have widened my horizon, introduced me to interesting people I wouldn't have met otherwise. Blogging keeps my mind active, as I write in a language different than my own, as you know. Have a happy day! Happy anniversary Judy, I've still got a couple of months to go but all the things you said are true for all of us. Through blogging, I've learned that I can maintain the discipline of writing everyday *if* I know someone is reading. And I've met about a dozen folks in real life who I *wouldn't* have met if it weren't for blogging. How cool is that? What have I gained from blogs? A lot. I like to pick several blogs and just sort of keep up with what they have to say. And I really enjoy and admire your postitism. And on my own site, which is neary as positive as yours, I just like to rant and rave on whatever pops into my otherwise dull brain. blogs, and the comments are a good part of it all. I love to see what other people are up to in their blogs. I have a little list that Icheck with my morning coffee......I am surprised how many people visit my blog. Happy Anniversary!! I have learned from your blog to not take life too seriously. I have learned that laughter IS the best medicine. Happy Anniversary! If I'm down, all I have to do is go to my blog. All of you make me feel better! The first thing I get from blogging (my own blogging, I mean) is stress relief. Making stories about my day and about what I see (today's blog isn't about my day, exactly) gives some shape to my life when things are seeming a bit... shapeless. It also changes the way I experience things, because I often find myself wondering whether this would make a good story... I don't know if I can explain this very well, but when things get on top of me (like last Friday) and I feel overwhelmed, some part of my mind is saying, "Never mind, you can write about this later, and it will all make sense AND you will find something to laugh at." As a reader, I love to find out how other people live and think. There are a lot of good people out there in blogland, and I've ended up caring a lot more about them than I ever thought I could care about people I've never met. I never knew that it was possible to be so inspired, moved, educated and entertained by non-professional writers, either. It really is an amazing phenomenon. 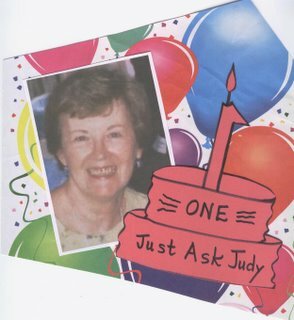 DEAR JUDY, CONGRATULATIONS AND HAPPY BLOG ANNIVERSARY! I am very happy to "meet" you and reading your intelligent, interesting, wise and many times funny and humorous "Justaskjudy". Through blogging, at first, I "meet" wonderful, lovely and encourage friends! Second, I've improved my English. Last but not least I learned about an immensity of issues and from the diverse experiences of other people. You’ve been tagged! Got weirdness? Reveal five different things about you that are “weird,” and then pass the tag along to five others. See my blog post of yesterday and today to see all the fun I had with this one. Happy anniiversary! It's almost a year for me, too and I am an Addict (yes, with a capital A!). Happy Anniversary! You can see how much people enjoy you and your blog, and it couldn't happen to a nicer person. I blog because there are many thoughts in my head and I don't want it to explode. Because I live alone and yet, have a lot to share. Great job, Judy! Of course, it's more than mere time: your skill as an observer and a writer makes us keep coming back! I've learned I'm not alone in my experiences, in my feelings, and my frustrations. I've learned that sometimes understanding someone else's viewpoint, doesn't mean I have to agree, but it does mean I can respect it. I've learned, there are special people all over the world, even more so than I knew before. I heart bloggers. I've learned that I have alot in common with a lot of folks I've never met in person. I guess what I learned is that it is no fun to take flowers to funerals. What I enjoy most is finding literate people like you to educate me about taking flowers to weddings, which is a lot of fun. Happy blog day!! For me I love to know that people can still laugh and have a good time with out all the swearing. Don't get me wrong I do my fair share but it doesn't need to be there to make things funny. Happy Blogging. After moving and with all the turmoil this last year and a half I found myself in a new city, new state and with only family for conversation. Sometimes, really more often than not, those conversations go off in all directions and we end up having no idea as to what the other was actually talking about. (lots of senior moments and hearing aid failures) So, here I have found others to converse with, share problems, little victories and memories with. I have found a wonderful "circle of friends". For this I am eternally grateful. Blogging fulfills me. I can get stuff out of me. And I love reading about other people. Happy ONE YEAR blog anniversary!!! Hooray! Blogging has really brought a new aspect to my life. I have always loved writing, and now I get to do it nearly every day, and have many pen pals who read and leave comments. I visit them and read what they've got brewing at their place and leave them comments. What fun this is! I love that I am in contact with people all over the nation and world that I would never have had the opportunity to know. You are one of those people. Happy Blogiversity! And may there be many more. What have I learned? I've learned that there are more nice people than the other kind, and that many of them have enriched my life. No exaggeration. I've learned that I love this sense of community and the friendships, like yours, that have wandered amazingly into my life to enrich it beyond my wildest imagination. Thank you for that very special gift. I've learned that there is always something more to write about and that I enjoy creating bridges to meet people that I wouldn't otherwise meet. Happy Year's worth of blogging!! I have learned that I need more strength to close the lid of the laptop and walk away from the computer!!!! Actually I just started Blogging less than a month ago and I LOVE LOVE LOVE it! It's so addicting it's sickening! But I really love it and I love 'meeting' new people! Happy Blogversary Judy! I feel much the same way. I like the sense of community I get from blogging, and the fact that my "socializing" can be done on my time schedule. Happy Anniversary...a little late, but still heartfelt. I love bloogging. I'm much more of a newbie than you, but it's given me glipses of other people's thought that I would never had the opportunity to view.